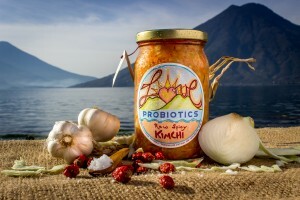 Love Probiotics’ Raw Spicy Kimchi is a vegan variation of the traditional, South Korean condiment. Like sauerkraut, kimchi is a well known digestive aid and immune system booster. Kimchi is also high in antioxidants and flavonoids, which decrease the risk of certain cancers and heart disease, respectively . Due to the presence of Lactobacilli plantarum, raw kimchi contains high levels of Omega-3 fatty acids, which greatly improve the health of your joints, and can decrease your risk of arthritis, depression, cardiac arrest, autoimmune diseases, memory loss and dementia, to name a few. Raw kimchi also contains high levels of vitamin A, B, C and K, as well as folic acid, and minerals such as calcium, potassium, iron, phosphorus, sodium and magnesium. Raw Kimchi is a live, unpasteurized food. Carbon dioxide, a biproduct of fermentation, may naturally accumulate in the jar. If storing outside of the refrigerator, pack kimchi back down under the acidic protection of the brine after each use. Kimchi will keep outside of the refrigerator, outside of direct sunlight, for several years.